Wellcome MS 8004 is a lavish codex without marginal annotations, with gilded initials and expensive pigments. It opens with a calendar and closes with a pilgrimage tract, in between are numerous texts on medical practice and astrological calculations. 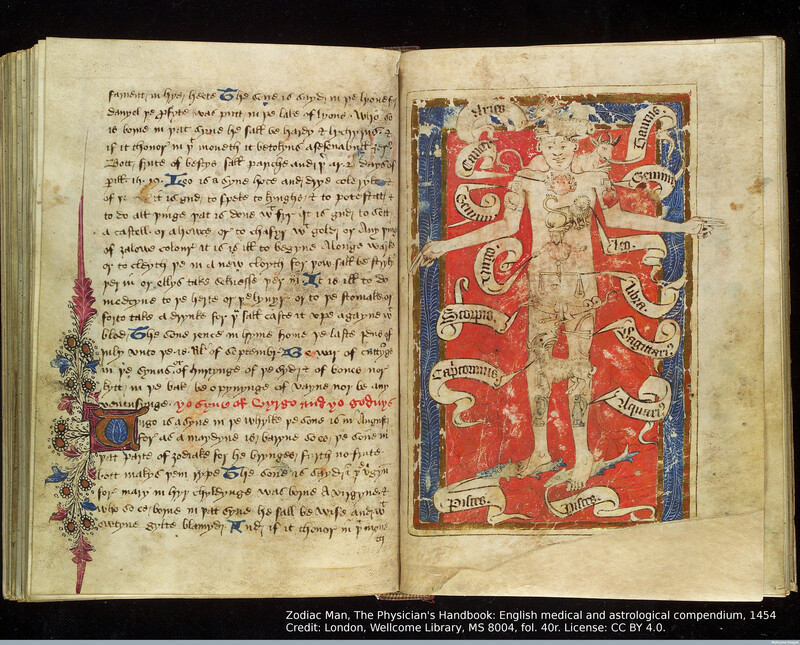 Wellcome 8004 also contains depictions of the Zodiac Man and the Phlebotomy Man. 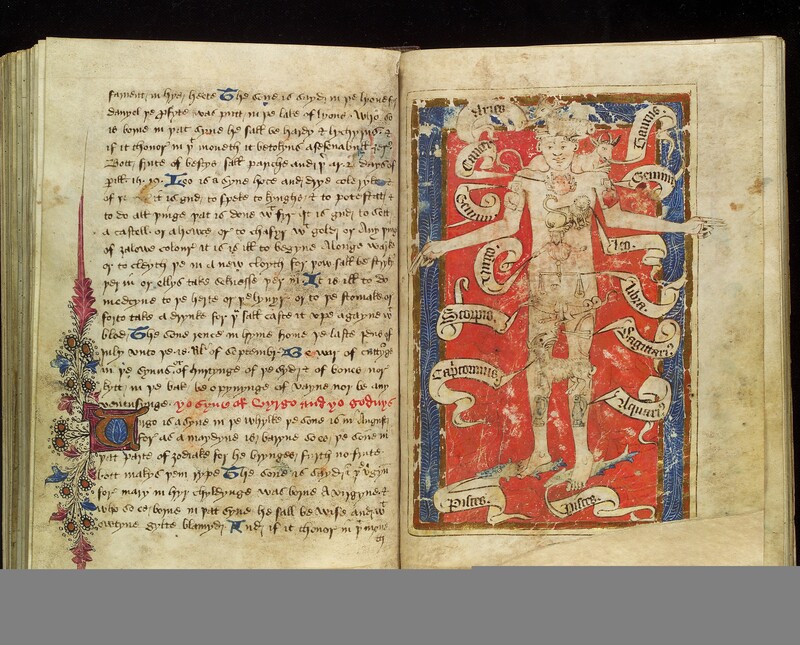 The two diagrams have been placed several quires apart, the Phlebotomy Man on folio 18r and the Zodiac Man on folio 40r. These depictions are unusual: the male bodies at the centre are more animated, seemingly in motion. In this article, I will position the two figures within a larger medical context and investigate how the iconographical idiosyncrasies correspond to their medical functions. It is first, however, necessary to look more broadly at the use of Zodiac and Phlebotomy Man diagrams. The Phlebotomy Man is iconographically and intellectually linked to the Zodiac Man. The structure and appearance of the two diagrams are often very similar and they are expressions of related medical practices. The Phlebotomy Man diagrams represent one facet of contemporary medical theory; the idea that illness could be treated through careful adjustment of the humoral balance within the body and that health should be maintained by blood-letting throughout the year.3 The schema shows where on the human body to bleed to cure specific ailments. The male body in the Phlebotomy Man diagram is usually shown naked in a frontal position. The image is often linked to the Zodiac Man through its appearance, placement on the page and the content of the text surrounding it. 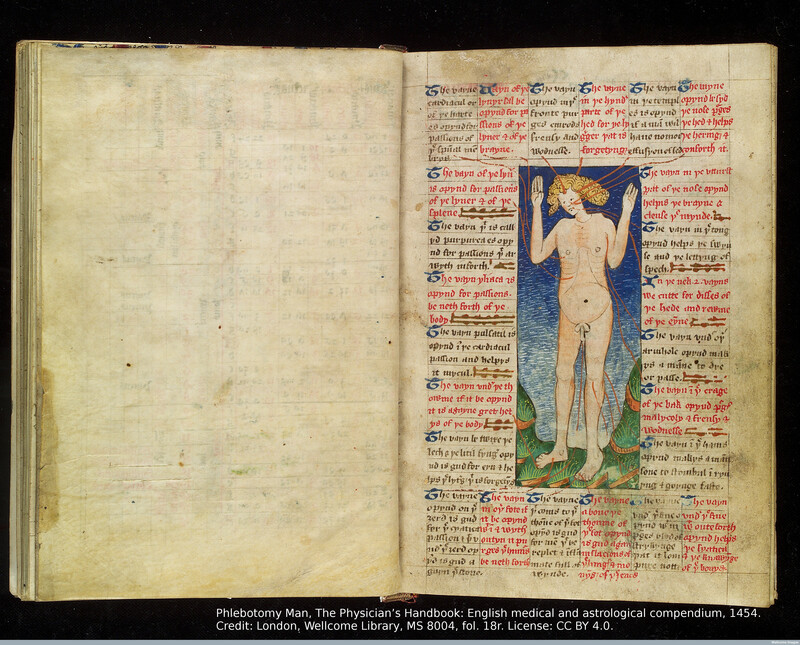 Clark further differentiates between the medical and non-medical uses of the figure, throughout the medieval period. He argues that at its conception the figure had several different simultaneous purposes and meanings. He claims that although the medical functions were known in the early medieval period, that ‘it may be fair to characterize the most ancient references to the homo signorum as specific instances of the macrocosmic-microcosmic analogy.’5 The Phlebotomy Man diagrams have not been as extensively studied as the Zodiac Man figures. Nevertheless, they are often understood as connected to these cosmological schemas and fruitfully discussed in relationship to them. Clark believes that the inclusion of the Phlebotomy Man, as a complimentary diagram to the Zodiac Man was perhaps to reassure prospective patients of the practitioners’ medical competency.6 Another example of how this image might have functioned in a social context can be found in France, where, in 1427, Charles VII ordered all barbers to display an image of the Zodiac Man in their shops, to guide practitioners in their medical practice and to protect the sanctity of the human body.7 The order reveals additional contemporary audiences and purposes of the diagrams. 1454, Credit: London, Wellcome Library, MS 8004, fol. 18r. License: CC BY 4.0. The geographical features of the landscape surrounding the male figure in this schema mirror the movement of the red lines connecting the adjacent texts with the body. Similarly, the Zodiac Man diagram has the symbols of the star signs drawn over the male form, accompanied by legends indicating the names of the zodiac signs. This figure is, as opposed to the Phlebotomy Man, not situated within a landscape, but rather drawn against a red and gilded background. The Zodiac Man is standing with his arms stretched out and his hands reaching outside of the frame of the illustration, he is breaking free of the confines of the borders on the page. 1454, Credit: London, Wellcome Library, MS 8004, fol. 40r. License: CC BY 4.0. The iconographical choices made in both of these depictions are indicative of their medical functions. The Phlebotomy Man is contained within the blocks of texts surrounding him, in a manner analogous to understanding phlebotomy as an adjustment of the internal balance. Similarly, the red lines connecting places used for venesection with text surrounding the body mirror the geographical features in the surrounding landscape, in the same way as the humoral balances fluctuated with changes in the seasons. Meanwhile, the Zodiac Man is a larger figure than the comparable Phlebotomy Man. The Zodiac Man is not contained by blocks of texts, but dominates the page. The figure is a representation of the cosmic influences on the human body, the effects of the macrocosm on the microcosm, and as such breaks free of the borders and the mise-en-page of the codex. A professional artist, not a medical professional, produced these diagrams yet the stylistic choices indicate a clear understanding of the purposes and intellectual content of the schemas. Further, when considering the manner in which the Zodiac Man’s hands are drawn, it is clear that there is still work to be undertaken on the possible use of religious or devotional images as models for medical depictions, and the potential relationship between this particular diagram and the pilgrimage tract that follow some twenty folios after. Camille, Michael, ‘The Image and the Self: Unwriting Late Medieval Bodies,’ in Framing Medieval Bodies ed. by Sarah Kay and Miri Rubin (Manchester, New York: Manchester University Press, 1994), 62 -99. Clark, Charles, ‘The Zodiac Man in Medieval Astrology,’ Journal of Rocky Mountain Association 3 (1982), 13-38. Clark, Charles, The Zodiac Man in Medieval Medical Astrology (PhD thesis, Department of History, University of Colorado, 1979). Rawcliffe, Carole, Medicine and Society in Later Medieval England (Stroud: Alan Sutton, 1995). Voigts, Linda and Michael McVaugh, ‘A Latin Technical Phlebotomy and its Middle English Translation,’ Transactions of the American Philosophical Society 74 (1984), 1-73. CITATION: Sara Öberg Strådal: A Closer Look at the Zodiac and Phlebotomy Men in Wellcome MS 8004, in: Mittelalter. 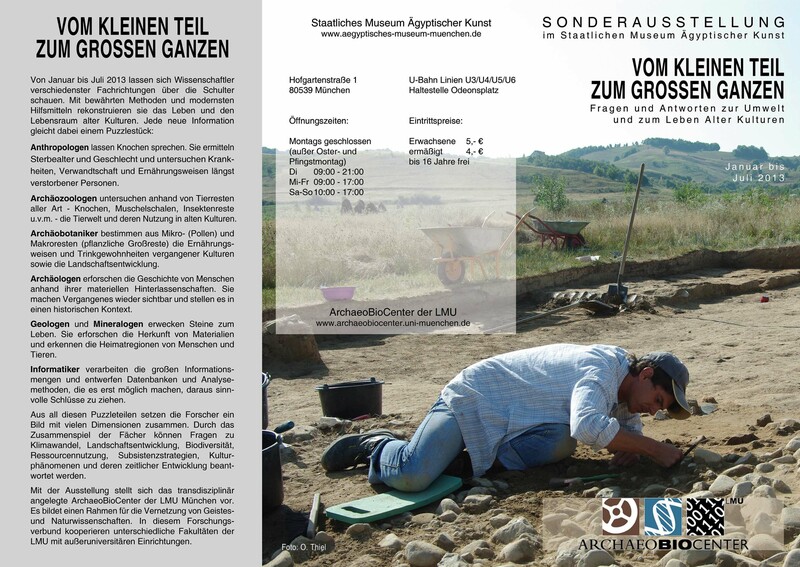 Interdisziplinäre Forschung und Rezeptionsgeschichte, 11. October 2016, https://mittelalter.hypotheses.org/8919. Sara studied Art History at the University of Glasgow and submitted her PhD thesis on diagrams in late medieval English medical manuscripts in October 2014. She is interested in text image relationships, representations of scientific knowledge, authority and intervisual references to Christian imagery. In her PhD she also studied the use and social function of medical manuscripts and the diagrams that they contained.